Can you believe that this rich looking pedestal bowl cost less than $5 to make? And that it’s made of glass, not silver? Read on to learn how you can recreate this look yourself! 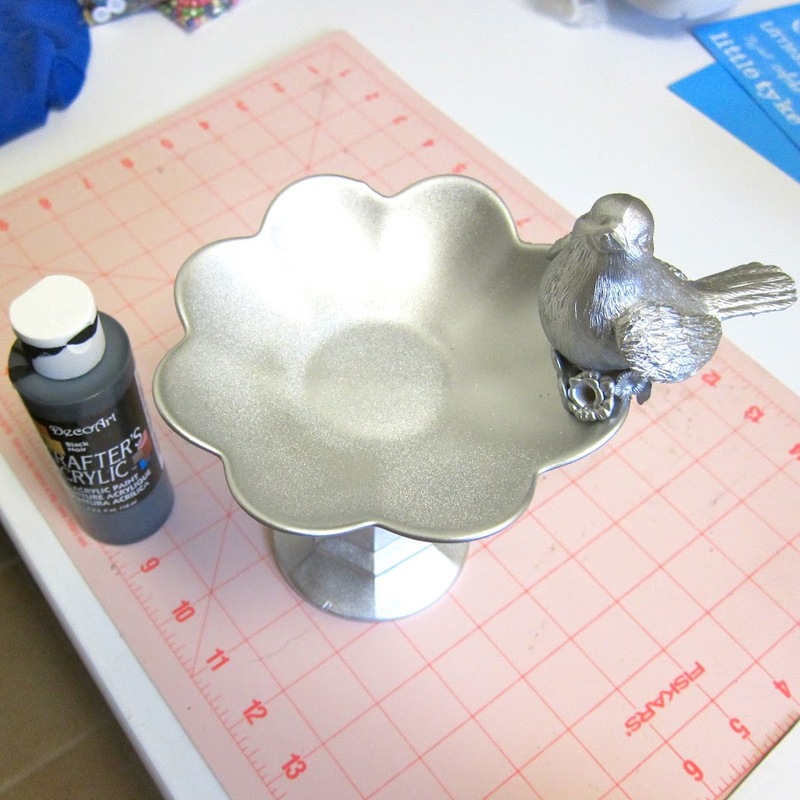 Turn Dollar Tree items into an expensive looking “silver” pedestal bowl. I started with three items from the Dollar Tree: the bird (I removed it’s wire legs), the candle holder, and the candle stick. I also used Rockin Beads Brand, 700 Frosted Mix Lily Flower Acrylic Beads, E-6000, white spray paint, Krylon Shimmer Metallic Spray Paint Silver Shimmer, and Deco Art crafters acrylic paint in black. 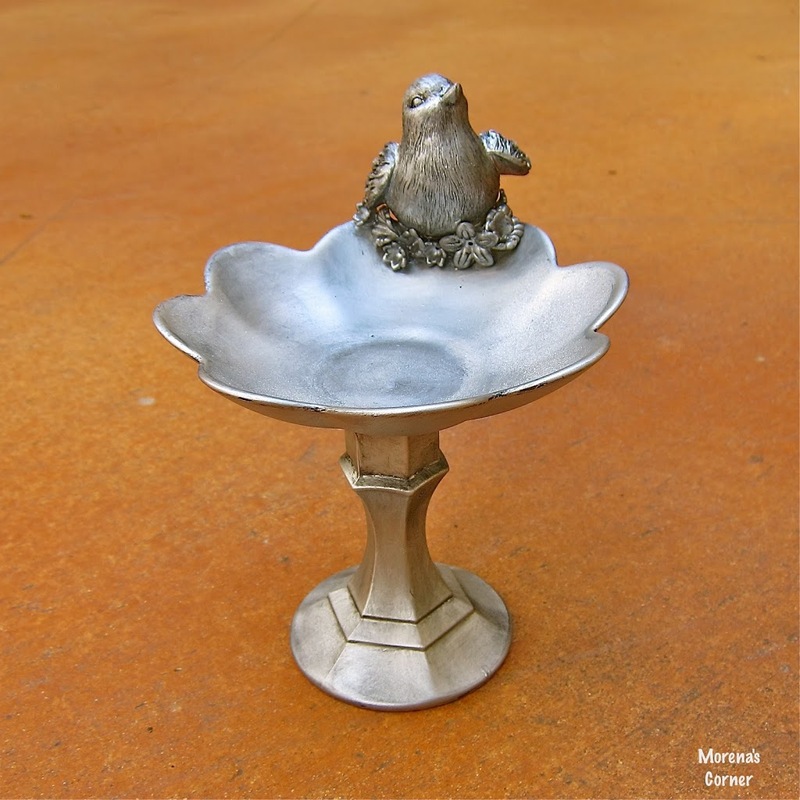 First I glued the plate, candle stick, and bird together using E6000. The next day I glued on the flowers, also using E6000. I let it dry for one day and then primed the entire project with inexpensive white spray paint (not pictured). 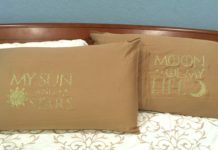 I used the Krylon metallic paint to cover the entire project. 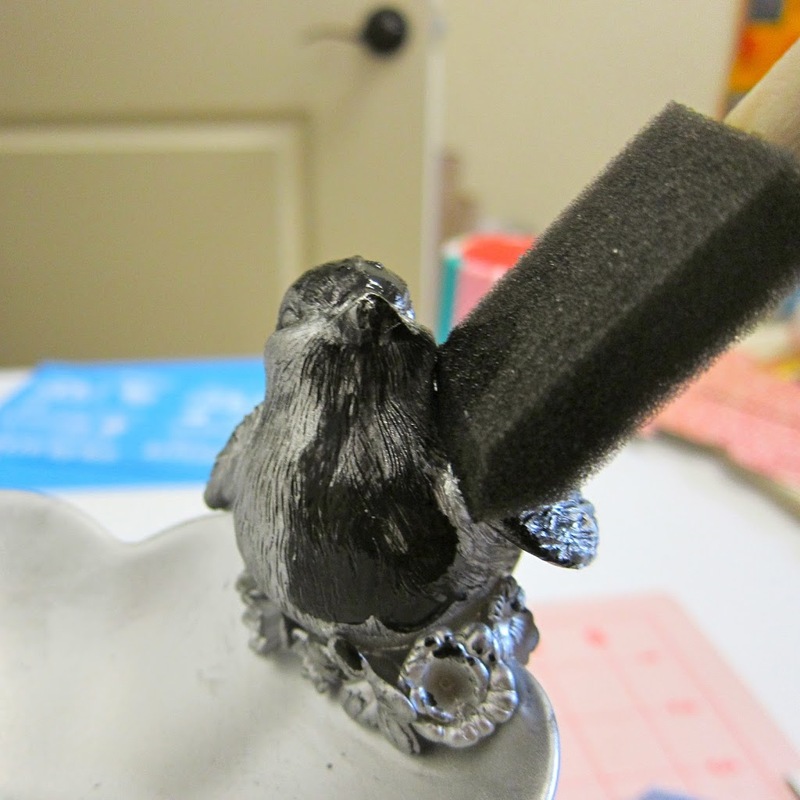 Use a sponge brush or a dry bristle brush to cover one section at a time with black acrylic paint. 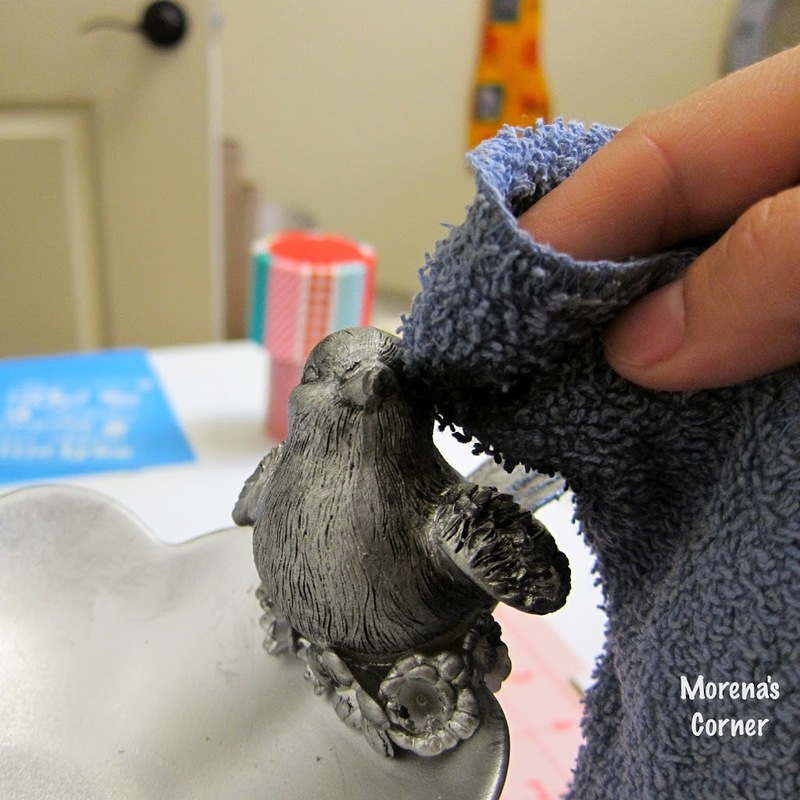 Gently rub off the excess paint with a dry washcloth. Work in small sections. If you make a mistake, just add more paint and then rub it off again. 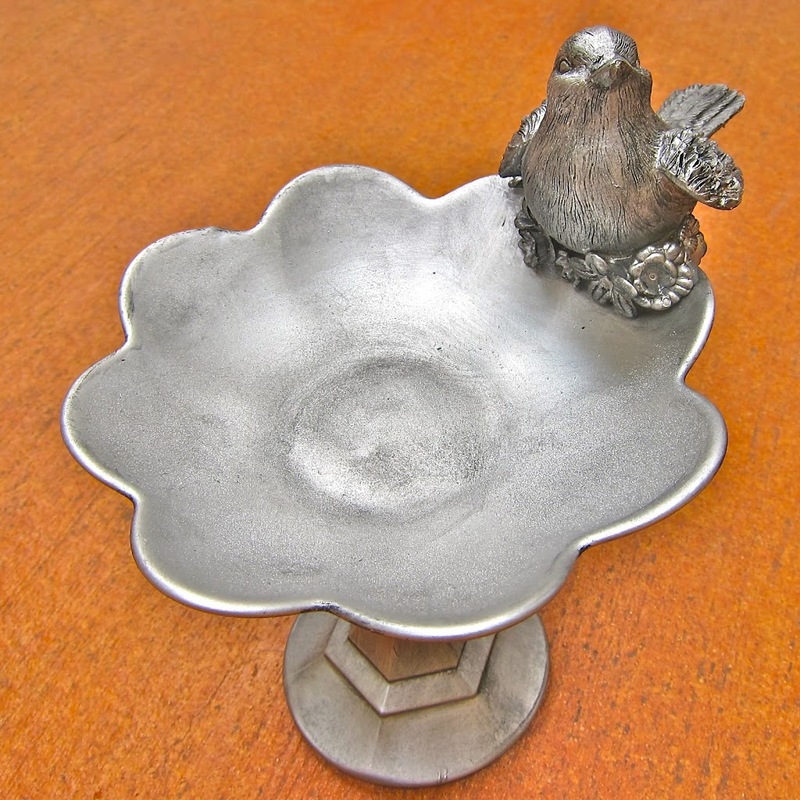 Repeat this process to cover the entire project (bird, bowl, and pedestal). Here is a close up of the finished bird. Doesn’t it look like aged silver? I truly love the end result and cannot wait to make more of these! 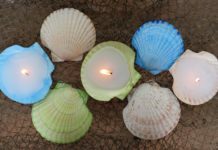 I hope you’ll give this fast, frugal, FABULOUS project a try! 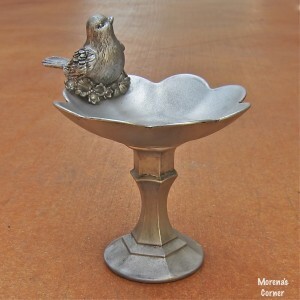 If you like this you might also enjoy my PLASTIC TO PEWTER tutorial. 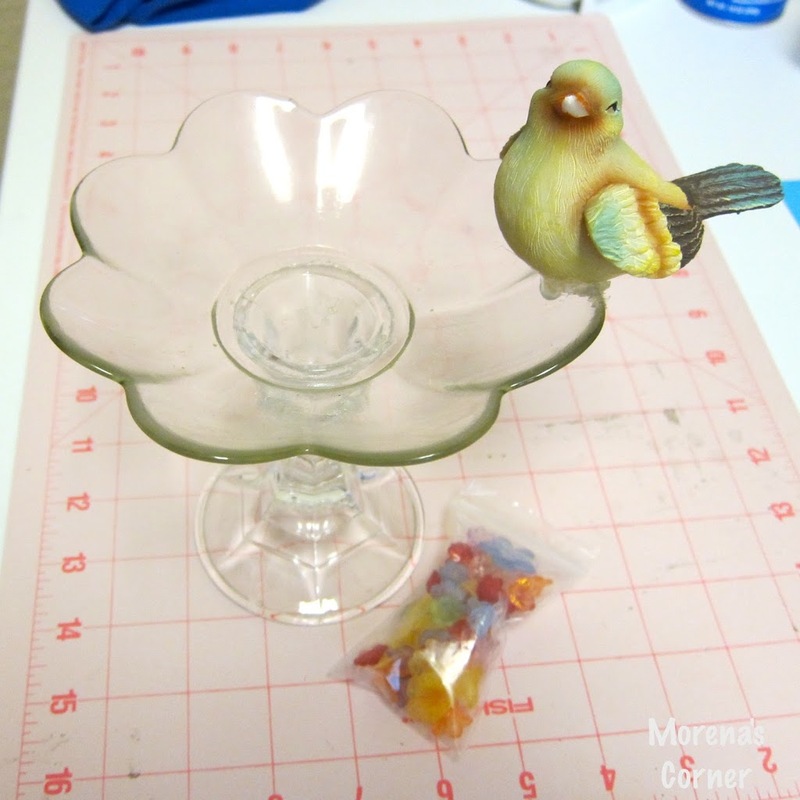 Check out my tutorials page for more dollar crafting and glass painting projects. This project was inspired by this piece at One King’s Lane. Very clever and so lovely!! I saw this on Pinterest. Thank you! It came out even better than I had envisioned! That is so very cute! I would have never thought to build it myself? I love it!! So craft and it looks very nice too! Sometimes my stuff ends up looking…well, like stuff glued together! Thank you! I have had my share of craft fails so I was thrilled that this project turned out better than I’d imagined it would! Love it! Congrats on the Newbie Spotlight! Im so doing this. Gonna take it one step further. I just finished (other than painting) my new sewing/craft room today. This would be amazing with an insert to make it a pin cushion. One Kings lane has nothing on this one. Fantastic job and oh so cute. Thanks for sharing witht he copy cat party. Wow, I think this is so cool…it reminds me of an Arthur Court design! Probably the cutest craft project I have seen in a LONG time. Love it!!! Thank you for sharing. SO CUTE!!! I love this!! I just had to visit to see how you made this amazing piece. I just can’t believe how super it looks. 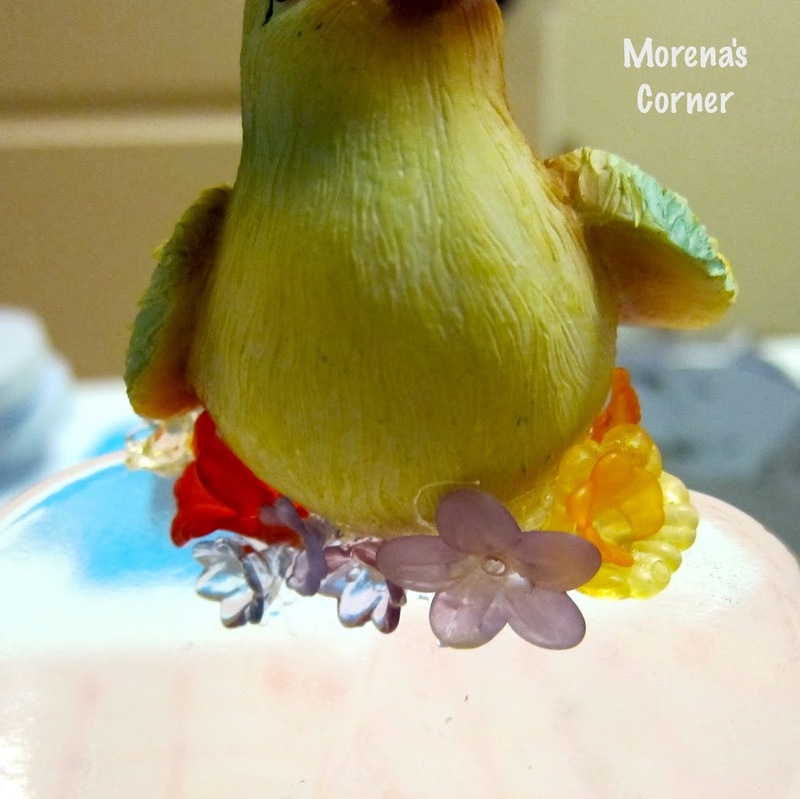 Just popping over from One Artsy Mama to see this little birdie:) I would love for you to share this at Freedom Fridays. So hoping to see you and your cookies there! Wow!! That is so pretty! I can’t believe that is glass! I totally thought it was sliver to begin with. Amazing!!! Thanks so much for entering this into the Project Pinterest Challenge! Best of luck to you! What can I say that hasn’t been said? I’ll just say it again, this is just so cute! What a great project, and it would make a wonderful gift, thanks for sharing! I’m never sure what glue to use, do you use this one often? Where did you get it? Thanks! Thank you for the compliment!! I use E6000 quite a bit…it really holds!! You can find it at craft and home improvement stores. I cannot believe how amazing this looks. Can’t wait to try this technique. wow! AMAZING! thank you so much for sharing AND for the great ‘how to’!!! found you via pinterest…now to check out the REST of your blog!!! Wow!! Very cool! I can’t believe that originally really ugly bird turned out looking so good, lol. It really does look like silver! Nicely done, Morena. 🙂 Thanks for sharing at Shine on Fridays! This is so cute~~and what a great idea! Question….where did you find the resin flowers? 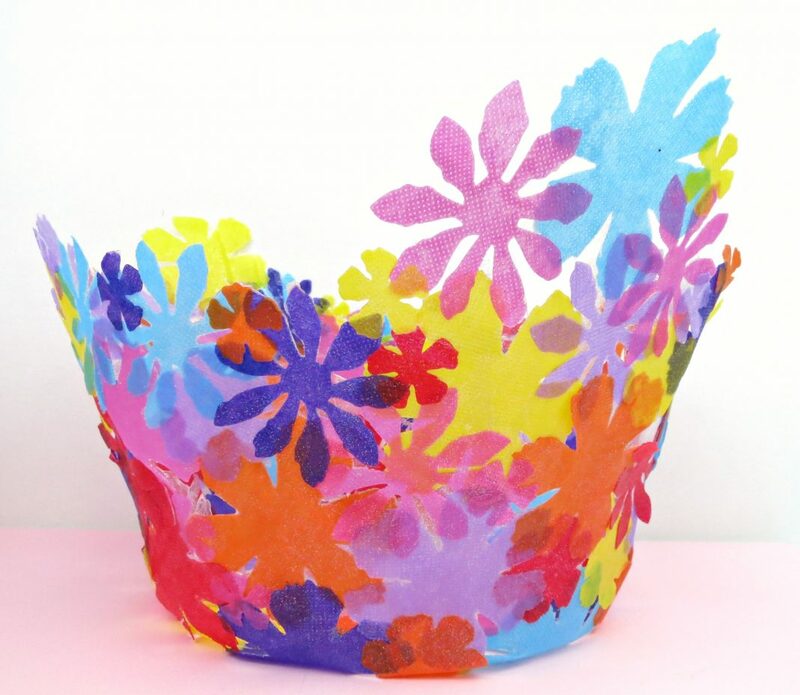 I have to make one of these…just perfect for tea party decorations! Thank you so much for sharing this cute little project. Great idea, Carol! I bought the flowers at The Plaid Barn, a deal a day site. This is about my fourth or fifth visit, I still can not believe how perfect this came out! 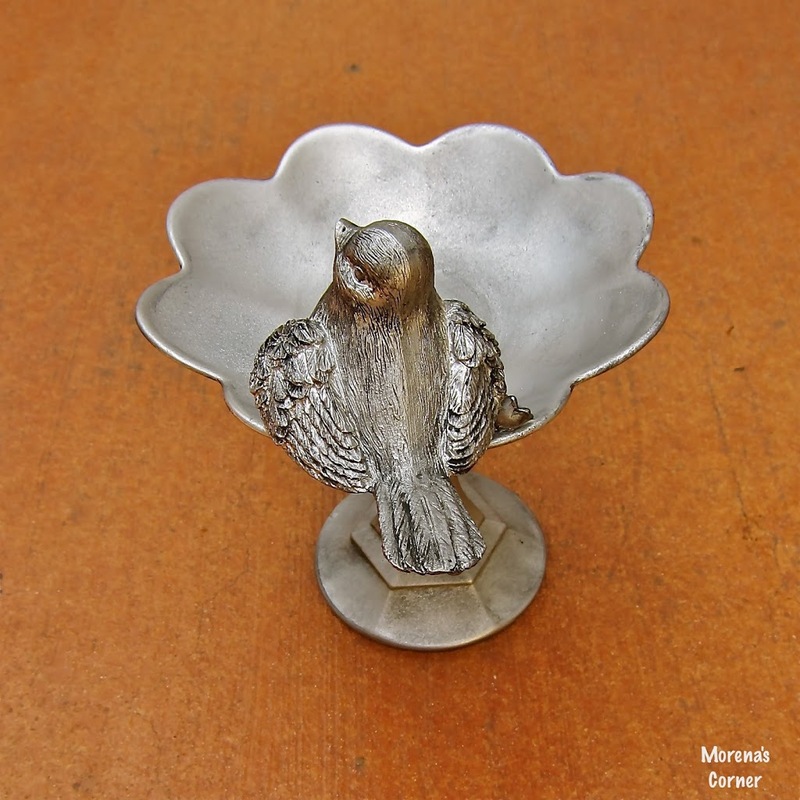 It is amazing that a plain little bird and bowl was redone into that beautiful silver piece. Thank you for sharing at Freedom Fridays. Have a fabulous week! Oh my – this is wonderful! Thanks for the tutorial. I would love to make one! Such a great project! I’d love to use this technique for something out in my garden. If you’re looking for another place to share your awesome tutorials, head on over to Etcetorize. Would love to see you there! You are a clever lady! I came over from Debbie Doo’s newbie party. I am going to have to try this for myself. OH. MY. GOODNESS. Fantastic!!! One of those projects that makes you go: why didn’t I think of that??? bravo!!! No way! This is fantastic. For the sake of continuity in our colour scheme I’d have to go with white if I was to try this project (who am I kidding? WHEN I try this project asap, obviously), but your silver version looks a million bucks. Way to go from cheap and kitschy to pretty and stylish! Onto my pinterest right after posting this comment. The look is great! Good job. What a clever idea! It turned out so well and I never would have thought it began life as inexpensive, mismatched items. I actually like yours better than the inspiration piece. Lovely. Wow! I’m so impressed. Love the results you got! Thanks for sharing this one. Your project is more substantial and looks much better than the EXPENSIVE one! That was amazing…thanks for sharing. I just saw your project on Knock off Decor and had to visit to tell you that yours is _way_ better than the original!! Given the opportunity to have either, I would choose yours any day!! I love it and will be giving it a try myself! Thank you so much for sharing your creativity!! I love this! If it wasn’t poring down rain I would go to the Dollar Tree right now! I found you through Knock off Decor, thank you for sharing. I agree yours is way better! This is unbelievable!! Love this! New follower of your blog…please visit me at shabbgals.blogspot.com too. That’s awesome and you done such a professional job on it. Congrats on winning the $Tree challenge, you definitely deserve it. So cute!!! I saw this on the DIY club’s monthly contest. I am going to try this! Thanks! This is super cute! I love the transformation. 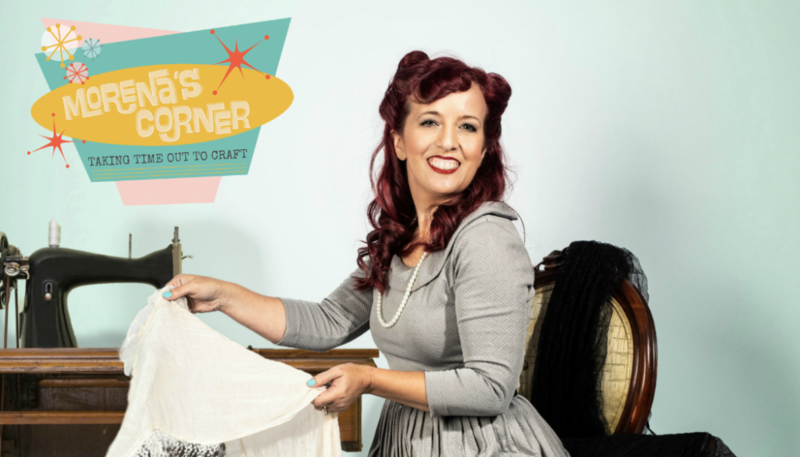 Thank you so much for entering in the Craftastic Competition. Good luck! This is too beautiful for words! Such creativeness! LOVE! and DOING THIS! 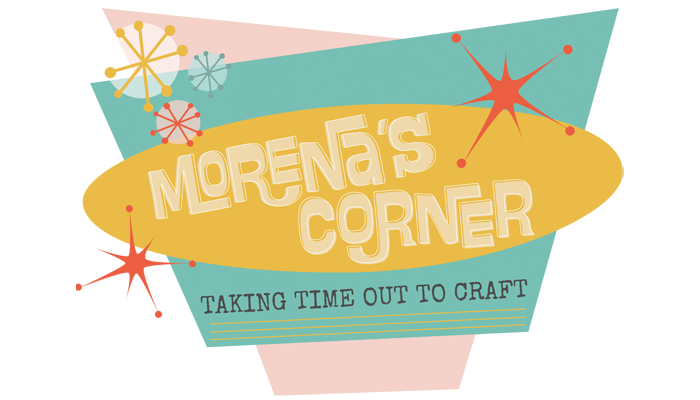 Morena, congratulations on being in the top 3 for the Pinterest Challenge. That little bird is just too sweet! L O V E this! I saw those birds at Dollar Tree, but didn’t think of removing the legs. This is going to send me on a trip tomorrow to go get some 🙂 Excellent project! Oh I love this! Congratulations on winning, you certainly done the $ Store proud. Beautiful! And no, it does not look like glass or that it came from Dollar Tree! Awesome craft. Wow it looks just great! I love how you have been so creative and taking three different -notsonice- pieces and turning it into one beautidul piece! And I love the en result on the bird! Looks so “proffesional”. I saw this on Pinterest. LOVED it. So clever. Will definitely give it a try. I love this technique! May have to give it a try! Just . . . WOW!! Love this. Couldn’t imagine how you made it when I saw it on Pinterest. Figured it was a yard sale find or something. Just wondering, was the birdie plastic? And how has the paint held up since you made this? Did any of it flake or chip off? I so hope not because I would love to make something like this too. OMG this is crazy!!!!! I could not BELIEVE the before!!!!! LOVE IT! The finish still looks great! I use this everyday… I put my rings in it every night…and no paint chipping! 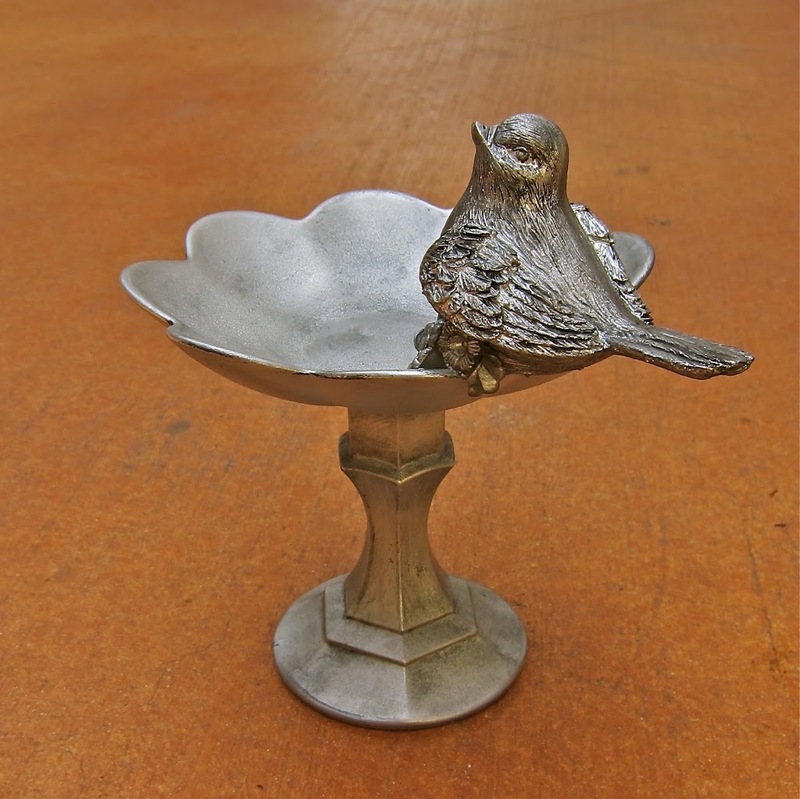 Is this bird from the floral department or a ceramic bird! You did a great job! Thank you! 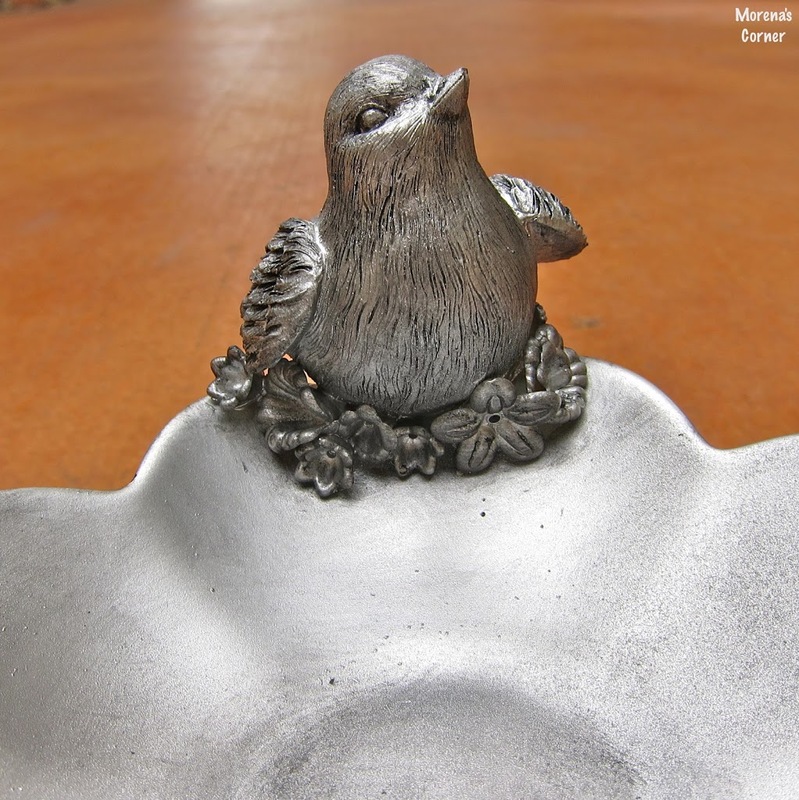 It’s a ceramic bird. I found your post on Pinterest, and I absolutely love it. I’m going to try to replicate. Thanks for sharing, it’s lovely. Great job.